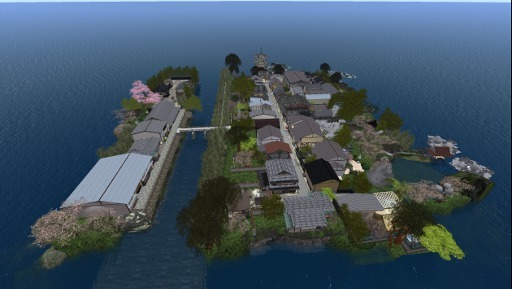 Miyagawacho is located on the Nadine sim in Secondlife and is our recreation of modern day Kyoto province of Japan. It is also the home of Hanafusa Okiya. Miyagawacho has a good variety of things to see and do for the resident and the visitor alike; from Cafe's and Bars, to our Sumo arena. We have regular weekly events in our Ochaya if you would like to experience a traditional Geisha banquet, Seasonal performances in our Theatre and events area. Ice cream cafe, Sushi bar, Onsen, Shinto and Inari shrines, 7 Seas fishing, Rowing boat rezzers to take a tour of the whole sim, There are also Beautiful gardens, Lakes and quiet areas, zen garden, Children's play area, Library, Museum and some of the best creators of Japanese products in secondlife. Our residents have permanent access to all of the above, along with a friendly atmosphere created by the Maiko of Hanafusa Okiya who are on sim every day, every week, so there is always someone around to help if you have any questions. We operate on European time zones but receive IM's by email to make sure that we are able to tend to your needs. We have a good selection of traditional and modern homes, ranging from small apartments for those of you on the go, right through to huge houses for the secondlife family. Homes are spread throughout the sim, offering the option to live in town on the main street or one of our cosy little alleyways tucked away with access to beautiful gardens and water features. Across the Matsubara bridge we have larger homes along the bank of the Kamo river. Prim allowances are negotiable so no need to worry if your chosen property has too few or too many prims. Simply contact one of our staff and we will change the prims to suit your needs.